How do you improve the bascule/arc of a horse who tends to jump with a shorter arc? My mare always clears the jumps and does so in good technical style (very correct hind end), but she tends to land very close to the jump. 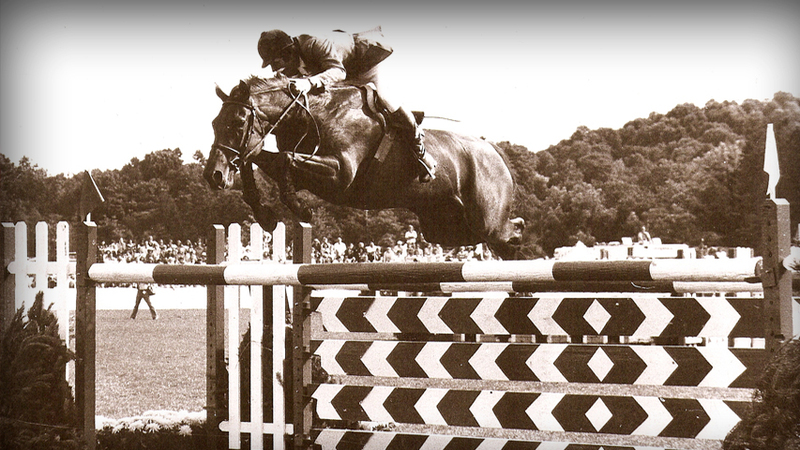 She can clear wider oxers and triple bars, but it seems like she only puts in as much effort as she knows she needs to to clear the fence – which wouldn’t be a problem except for the fact that when she lands short, we have to make up the distances down the lines. I have been working on it with her, and it has gotten better, but I was wondering if you had any ideas or suggestions for exercises we could do to encourage her to land farther from the fence and carry a pace away from it? In thinking about this issue with your mare, a couple of questions come to mind: 1) How experienced are you and your mare currently; are you competing or schooling at or above 1.10 M or only over smaller jumps? and 2) What is her general attitude toward her work; is she normally pretty easy going toward jumping or does she tend to get a bit more “up” or quicker as you begin jumping? 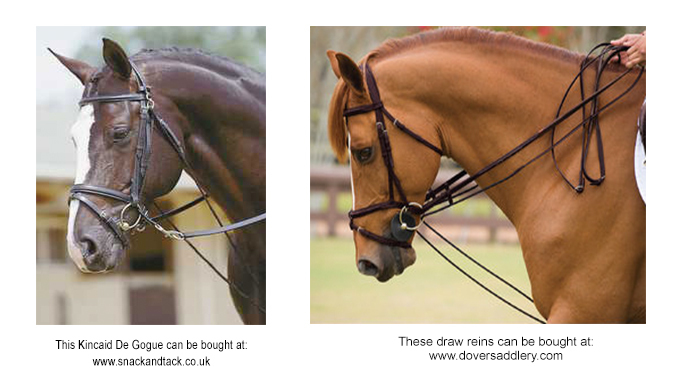 When looking for exercises to strengthen a horse’s weaker areas, it is always important to avoid creating new issues! If you or your mare are relatively new to jumping, simply giving both of you a bit more experience using slightly different stride length on the approach to a line, along with being careful that you maintain your balance in the air and keep your focus from dropping down in the air, might be all you need. You would be amazed how small changes in the rider’s balance, timing, focus, and release can affect a horse. Always use help on the ground and/or video of your rides to carefully analyze if there is anything you might be doing that would encourage your horse to shorten her arc or not travel the straight line between two jumps. If your mare maintains a relaxed, yet attentive attitude when you are jumping, and you are independent in your position over the jump, there are some exercises you can use to improve the arc over a fence. Generally horses with longer strides, and a very eager attitude, tend to over-extend their arc over smaller fences when they are greener; while quieter horses, or those with naturally shorter strides, tend to cut the arc a bit short. 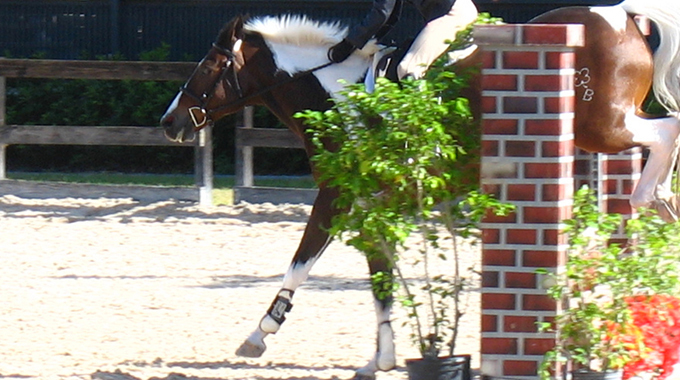 Using something on the ground before and after a jump can help a horse learn to center their jump. 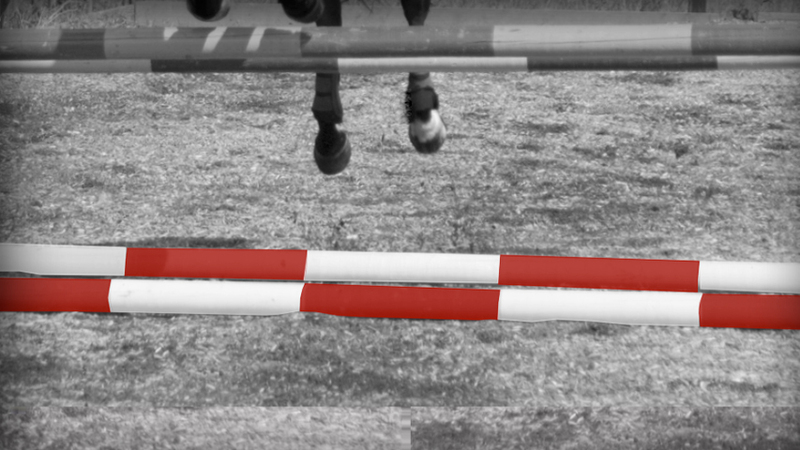 When using something on the landing side of a jump, I highly recommend using a flat wooden plank (or even a 2” x 4” painted white) in lieu of a round pole, as it is a safer alternative just in case your horse miscalculates his landing. 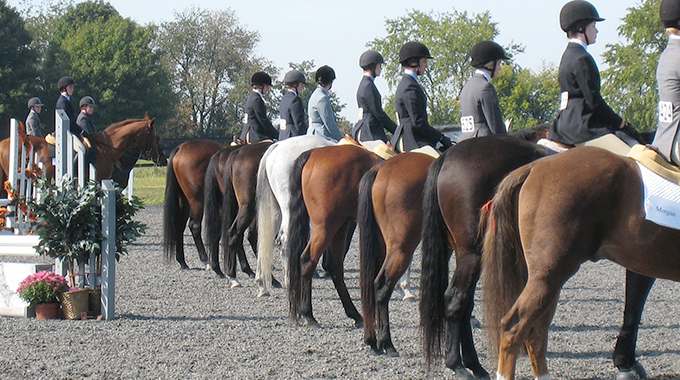 Begin approaching at the trot (going slower allows the horse time to figure out the exercise). Start with your trot-in rail and landing plank/rail at a comfortable distance before and after the small jump (8’ to 10’ depending on the size and stride of your horse), and gradually extend the distance to the landing rail until your horse is landing solidly and pushing off strongly to canter away in balance. When your trot work is solid, begin at the canter. Now I recommend placing poles one stride before and after the jump – 19’ to 20’ is a good place to start when using poles or planks instead of jumps before and after. Again, have someone on the ground gradually increase the distance on landing. Always be sure your mare does not speed up rather than making her landing stride in rhythm, straight and powerful. When a horse is confident with landing a bit further from the fence, and using a powerful yet not hurried stride away from the fence, the rider should have the feeling of asking for this response in the air. 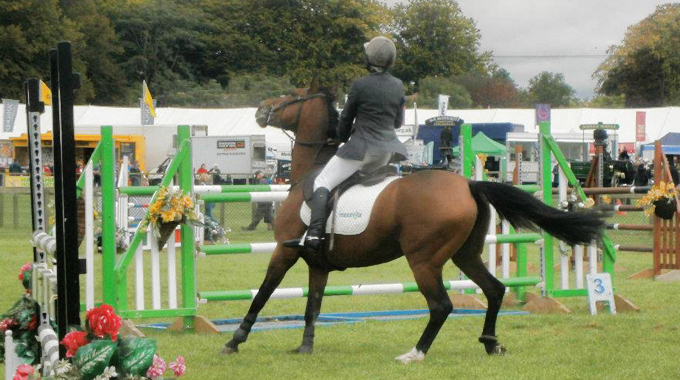 At this level of experience, a horse/rider pair destined for the jumper arena should be able to alternate ‘waiting’ and ‘forward’ rides between two jumps of moderate size. Begin with a slightly forward distance between two smaller jumps (perhaps 74’ or 86’), ride it quietly in an even rhythm on a shorter ‘waiting’ stride to get 6 strides in the 74’ or seven in the 86’. Don’t focus so much on the second jump, and allow your quiet horse to land quietly and stay on a shortened stride to get the “add.” Then do the line in the more forward “normal” to “forward” striding. 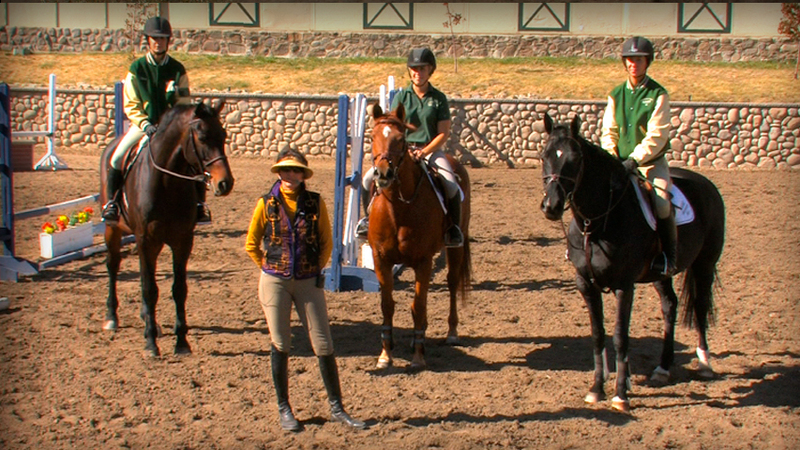 In this case, focus clearly on the second fence as your horse leaves the ground, and encourage your horse with your leg to use the extended landing and powerful first stride. If your horse responds well in the first couple of strides, you will easily reach the second fence by simply maintaining your straightness. Don’t keep pushing, but allow your horse to confidently negotiate the line in one less stride. With consistent, good riding, an experienced horse will learn to carry either the longer or shorter stride, in rhythm, with only the simple change in the rider’s attitude. Good luck as you make small but steady progress toward your goals with your mare!